We take pride ourselves in offering a superior range of Waterproofing Solution which is fabricated using best grade raw materials that are sourced from reliable vendors that ensure desirable durability. Our range of this solution is very strong Integral water purifier for both concrete and plaster. This is available in various sizes as per the requirement laid down by the clients. The product disperses uniformly in addition and Its effect can be felt In wet concrete itself. Adhering to WIG ratio in the range of 0.45. 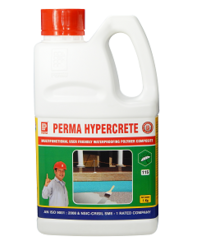 Add Perms concrete and mortar along with water at the rate of 500gms per bag of cement. We have been reckoned as one of the top most providers for Integral Water Proofing Compound solutions that help all our customers to establish a distinct presence on the waterproofing solutions. Our products are also known for its affordable price, use of advanced equipment, and which are Ideal for different environmental conditions and these can also be customized in various requirements as per the clients. We have gained vast expertise in offering a better-quality range of Integral Waterproofing Compound that are manufactured using top quality raw materials which are sourced from certified vendors in the market. This is most extensively used in concrete and mortar is one of the precautions taken to achieve a waterproof concrete or plaster. Our range of these is available in various sizes and at reasonable prices. Durability is increase due to air entrainment. Segregation bleed and there after honey combing is prevented. Surface finish of concrete and plasters improved. Attack by Sulphates and Chlorides from ground water in coastal areas is well tolerated. Add Plast -0 -Proof in concrete and mortar along with water at the rate of 100ml perbag of cement In demanding situations the dosage could be doubled. It is emphasized that integral water proofer and plastic is erosional help in making a good concrete better. Hence observance of good construction practices is of utmost importance for achieving the over a goal. Our company offer our clients with Injection Grouting that are widely appreciated for their quality, efficiency and durability. These products are manufactured using best grade raw material and advanced methods of production. We deliver products to our customers only after thorough quality testing. These products can be availed by our customers at market leading price. 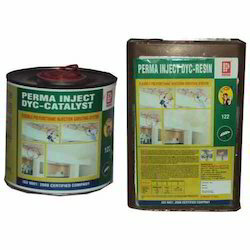 Perma Inject DYC is supplied in packing of 25 kg for prepolymer resin and the catalyst in 2.5 ltr packs and 10 kg for prepolymer resin and the catalyst in 1 ltr packs. 9 months from the date of manufacture. These products are both temperature and moisture sensitive. Hence it is utmost important that these products are stored in dry conditions between temperatures 10 to 300C. We have gained vast expertise in offering Basement Waterproofing in a wide range of our clients, which can be obtained from us at market leading prices. Our range of these basement waterproofing products is highly durable in continuously wet conditions and it is not affected by UV rays and is also known for its high tensile strength and resistivity to adverse conditions. We are highly engaged in offering a huge range of Waterproofing Chemicals service to our valuable clients. Our service helps in compelling and vibrant showcasing of the company attributes to the entire market. Our range of these waterproof coatings is widely used in newly constructing buildings such as shopping complexes, residential buildings. Our products are preferred for its fast and convenient, suitable back up functioning and also for its promptness and reliability. Perma Eazee Coat is used for water proofing all types of RCC surfaces such as roofs chanas, parapet all sand external walls. We are a prominent firm engaged in manufacturing and exporting a wide range of Crystalline Waterproofing to our respected clients. These are made using Perma seal powder procured from reliable vendors in the market. Our ranges of products are widely used in various applications like arresting leakages from old and new leaky overhead and underground water tanks. Clients can avail these from us at affordable prices in the market. 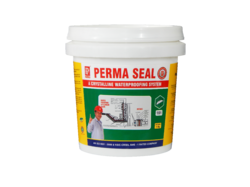 Perma Seal is used defectively for arresting leakages from old and new leaky overhead and underground water tanks. Perma Seal is brush applied hence applications simple. Can be use in any season. Repair all cracks by chasing out to form 'V' shaped groove 10 mm wide and 10 mm deep. Prime the groove by Perma Seal slurry and fill by cement sand mortar mixed with 20% Perma Seal Powder. Saturate the entire surface to be treated with water and avoid stagnation of water in depressions and recesses. Mix Perma Seal powder 2 ½ volumes with 1 volume of water to form a uniform consistency slurry. Brushes apply this slurry by nylon brush on the water saturated surface in two coats. Plaster the surface immediately and cure normally. 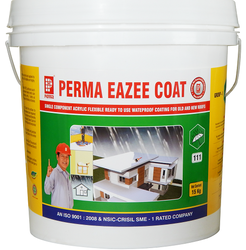 Perma Eazee Coat is used to waterproof all types of RCC surfaces such as roofs chajjas, parapet walls and external walls. Asbestos cement sheet roofs can also be waterproofed using scrim cloth at the junctions, overlaps and J-bolts as reinforcement. Eazee Coat is applied directly from the can. Eazee Coat cures to give a permanently flexible and resilient surface resistant to a wide range of temperatures. Can be used on wet surface and during rainy season. Waterproofing Normal Concrete Clean the surface to remove all loose particles and any deleterious matter. Repair all cracks, honeycombs and blemishes from the concrete surface. Brush-apply Eazee coat primer on the entire surface liberally. Primer is prepared by diluting one part by volume of Eazee Coat with one volume of water. When the primer coat is just dry apply the second coat running the brush perpendicular to the first coat. Provide fiber-glass or scrim fabric at junctions of vertical and horizontal surfaces after one coat then apply the second coat. On Asbestos Sheet Roofing: Provide scrim or fiber-glass fabric at J bolts and junction of sheets over one coat of Bitu Coat and then brush apply Eazee Coat on the entire surface in two coats. Damp Proof Course:On the cleaned plinth apply two coats of Eazee Coat. The second coat applied after about four hours of the first coat. When the second coat is still wet blind it with clean sharp sand to provide mechanical key. Note: Stir the material well in the container before use. The same shall vary depending upon specification and type of application and porosity of surface. 17 to 20sq-ft/kg when applied neat. 12 to 15 sq-ft/kg when applied on a reinforcing material. Eazee Coat is used for waterproofing all types of RCC surfaces such as roofs chajjas, parapet walls and external walls. Asbestos cement sheets roofs can also be waterproofed using scrim cloth at the junctions, overlaps and J – bolts as reinforcement. As a damp proof course applied under the first layer of bricks hor blocks in masonry works. Eazee Coat cures to give a permanent flexible and resilient surface resistant to a wide range of temperatures. With significant industry experience, we are providing waterproofing compound for concrete and plaster. This product is water-soluble and makes the permanency ingredient of concrete and plaster to make them waterproof everlastingly. Our range of waterproof compounds for concrete and plaster enhances working and assist in attaining dense concrete or plaster. Injection Grouting Water Proofing comprises two components; one is pre polymer resin and the other being catalyst. Both of these components blended and injected into the concrete or the RCC structure, by utilizing single component pump, which can be manual or motorized. When injected grouting waterproofing creates a partially rigid and partially foam constancy when it is exposed to moisture or water. This foam structure efficiently obstructs water from leakages from the structure. Backed by the significant industry experience in providing a superior quality range of integral water proofing compounds, which is manufactured utilizing high quality raw, components that are acquired from the trustworthy and certified market sellers. These are widely utilized in concrete and mortar, this product is one of the precautions taken to accomplish waterproof concrete or plaster, this excellent range of Liquid integral waterproofing Product is accessible in an assortment of sizes as well as affordable rates. As a leading water proofing chemical manufacturers we also offer Waterproofing Polynet Butyl Adhesive Tape, which is single side butyle rubber adhesive tape with toughened aluminum foil backing polynet and that is utilized for waterproofing all joints in during construction procedure as well as after it. Our expertise allows us to offer supreme grade and durable Damp Guard Integral Water Proofer in a wide range which can be obtained from us at reasonable price range. These are manufactured using premium grade raw material in order to meet the prevailing quality norms of the industry. Our ranges of these waterproofing products are highly appreciated for their high performance and superior quality. 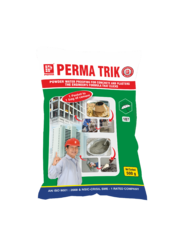 Perma Trik has effective chemical ingredients which water proof cements permanently. Perma Trik is a ideal for concrete as well as plasters. The product disperses uniformly on addition and its effects can be felt in wet concrete itself.